A wonderful meeting was held in Lima from March 22 to 26. 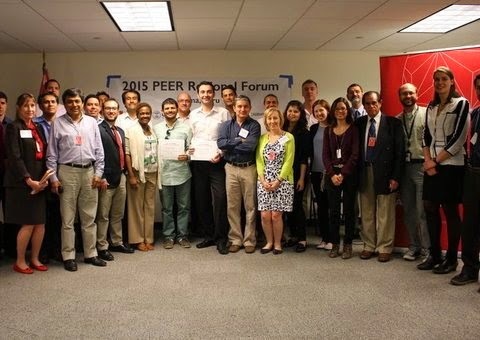 Sponsored by USAID, the principal investigators of PEER projects in Latin America and Caribbean region presented their achievements, had a great chance to start new collaborations, and learned more about other funding opportunities and about communicate science, technology & innovation to the general public. It is hard to highlight specific moments, because most of them was really instructive. The flash talks, however, were particularly challenging for most of us. The mission was to communicate the progress and impacts of your work in just three minutes, using the model of FameLab. The training for the flash talks took three of the four days of our gathering. Six PIs were voted to present their talks at the US embassy in Lima. These final talks were recorded and I hope to share the link for the videos and pics soon. Note: more about this meeting in the text from one of the panelists, Juan Casasbuenas from SciDev.com. Picture was bored from Juan's post and is a courtesy from USAID.